FREE is not a compelling reason to acquire something you do not need and will not use. I love saving money, but bringing things into my home I do not need does NOT save me money. Buying things with a coupon I wouldn’t have purchased otherwise is NOT saving me money. Purchasing excess stuff at garage sale prices can be more expensive than saving my money to pay full price for something I really want. Purchasing for my kids is not an exception. Instead of filling stockings and Easter baskets with an abundance of “cheap” junk, it is better to have fewer items that are more meaningful (not necessarily expensive). Stop feeling like you need to fill a void with stuff. Free things come with a cost. Every time you have to touch, clean, or move something, that is a cost. Your time is valuable! You pay rent for every item taking up space in your home. Manufacturer’s pay for those samples in some way, usually with increased product prices. Fellow consumers are paying for that pile of unused samples. Clutter costs your peace and energy. Anything sitting around our homes that is not beautiful or functional is clutter. I love a good deal. A good deal is when you save money for something you were going to buy no matter what. For my baby, I was able to find a used crib, swing, and a few other things at awesome second-hand prices. Some friends have even given me awesome baby stuff for FREE, but I have also turned down kind offers of free stuff I don’t need by saying “no thank you”. When I redecorated my daughters’ rooms, I was on the lookout for quality used wood dressers and night stands that could be re-finished, and ended up finding awesome stuff for prices I loved. Free stuff and good deals are awesome, but let’s just be smart about it, okay? Holidays can be a time when the need for FREE and DEALS and COUPONS comes out in a crazy way in people. Don’t be a crazy person! Let’s focus on the people we love and the meaning of the holidays we celebrate, not all the stuff. Phew, so glad to get that off my chest. Carry on! Love this Mary! I was just saying to my husband last night that I don’t have much for my kids’ stockings yet and he said we can just fill them with a bunch of dollar store stuff closer to Christmas. But I’ve spent the last few months decluttering dollar store stuff that they’ve been given over the years so why would I buy more now? I’m going to find a few things they’ll actually use as well as some consumable items and put those in instead. Thanks for a great reminder to keep the clutter down! 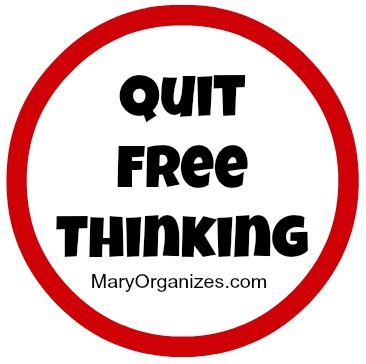 I still remember my History teacher in High School repeating over and over and over “There is no such thing as free.” I think of that all the time. It is so true. So I tell my clients and anyone who will listen “There is no such thing as free” as many times as they need to hear it. I am definitely not into couponing, but people ask me couponing questions all the time like I would know. :) I just don’t think it is a good idea, but yes, organizers get clumped in with couponers, because it takes a lot of organizing to keep up with all the couponing and stockpiles. It just doesn’t fit in with my philosophy! Everything else you’ve written is lovely … Except this. I can’t get this out of my head, because it sounds so, sorry to say, condescending toward those who coupo. It really sounds like you’ve got a stereotype of an extreme couponer in mind, one who goes store-to-store clearing shelves to get duplicate items because they’re free. Then they’ve got their hallway lined with shelves or a bedroom turned stockroom and probably can’t use stuff before it expires. I hope that’s what you mean, because I know plenty of people who use coupons to buy a normal amount of groceries for much less, and that seems like a smart use of money to me. I can’t imagine why you’d think paying more for the same item is a better idea. It has zero to do with clutter control. Saving money doesn’t mean crazy hoarding. In fact, I’ve been hitting the sales but not stacking coupons with them, and it’s high time I did. Maximizing our income DOES fit in with MY philosophy. Well, to be honest, I think you’ve chosen to read more into my words than I’ve written and be offended. Those were some of the lines from this blog post. I still stand behind this 100%. This is an important reminder to people to not bring things into their home that they do not need and most likely will not use. Becoming better at this step means less de-cluttering in the long run. Thank you for your comment! We ALL need to be reminded of this. It is our human instinct to collect and gather! If you have too much free stuff like food, household supplies or beauty products please donate to a shelter or food bank before it expires. Perspective is a powerful thing!